In recent months, Mexico City has finally started receiving some of the focus it deserves as a melting pot of underground music culture. It’s unsurprising that a city of over 20 million inhabitants has a rich and diverse musical landscape, but it had perhaps escaped many people's attention exactly what is bubbling under the surface. One of the producers currently making some of the biggest waves is Demian Licht, the pseudonym of Luz González Torres, whose Female Criminals Vol 1 has just been released on her own Motus label. The EP is uncompromising underground techno, a lesson in hard-as-nails minimalistic production with a futurist edge – sharing something in common with early pioneers such as Robert Hood and Daniel Bell. Licht aligns her music with a countercultural aesthetic of resistance and change - and while drawing from cinematic and musical influences, she is driven by a desire to inspire a cultural shift within Mexican society. Luz, currently the only female Ableton Certified Trainer in Latin America, has been developing this concept over several years, and is finally starting to create an outlet for her vision both within her home city, and on a global stage. We caught up with her to talk about her approach, influences, and how her involvement with projects like Discwoman is changing the landscape for underground artists in Mexico. The Female Criminals EP has a very distinct feel – from the sound design to the atmosphere and the wider concept behind the project. How long have you been working on electronic music, and how do you think your sound is evolving? I started making music ten years ago. I left high school, and I decided to start studying sound engineering, so I came to Mexico City from my hometown Querétaro. I was listening to Chemical Brothers and I got completely obsessed – I wanted to go deep into what electronic music is. I studied sound design and music technology, and a friend who now also teaches Ableton turned me onto Live. I was making more electro oriented stuff with synth bass and raw rhythms – I started off on Reason and eventually moved to Ableton. Now I’m into modular stuff. I’m actually trying to start importing modular gear from Europe to Mexico. There’s a stripped back, trippy element to your productions that perhaps references Detroit techno. Is that an influence? I don’t think so, I think it comes more from the 70s and from Germany. I’m a big fan of Krautrock bands like Can, who are not completely related to electronic music, but these were for me so influential on my music. Another is Klaus Schulze, of course Kraftwerk too, but I think Can and Schulze have been the bigger influences for me. More contemporary influences and also from Germany are Raster-Noton, Alva Noto and so on - I’m really into these aesthetics of minimalism, and the connection with this Japanese wabi sabi style. Less is more, for me. How did the project take shape? My studio was in the basement of my home in Querétaro. I took over the basement when I left high-school and named it Fluxus Sound Lab – inspired by the avant-garde art movement of the 1960s. Last year I spent seven months completely isolated from the world producing this record. Originally the concept came from a visual influence – the David Lynch aesthetic of deep and sinister circumstances, but I tried to represent it through audio. I was also investigating a lot about transgressive women in rock ‘n roll – Patti Smith and Kim Gordon etc, so I wanted to put this energy that rock ‘n roll has inside the music and the live performance. Female Criminals is techno orientated and can work in a club, but for me I wanted it to go further than the dance-floor and to make it a performance when I play live. Can you tell us more about the technical process? In terms of production process it’s always different. For example, for Female Criminals Vol. 1, the first stage was the selection and sound design of all the elements that would fit into the notion behind the project. I used Reaktor, Sound Toys, Moog’s software apps, Doepfer Dark Energy and a couple of sound libraries to develop sounds and textures that I see as linked to the influence of Lynch’s work. In terms of harmony I worked only with minor scales which I love because they are evocative of dark emotions for me. I think "Sin" is the track that represents this idea. For the main piano sample I used the EchoBoy plug-in, which works perfectly with my idea of clean & elegant sounds. It brings a subtle texture into the sample that I was looking for. In addition, the noise pad in the background works to increase the tension, interacting with the looped sample of my voice. All this together, for me, provokes a feeling of unease and mystery that I experience in Lynch movies. Licht’s record label, Motus, has been the vehicle for her releases so far, and central to her thinking in terms of the idea of technology and transgression playing a role in transforming society. The manifesto responds to the idea that the evolution of society is stalled through “sexism, conformity and ignorance”, and suggests connecting the “country culturally, musically and technologically with artists and inventors of sound production technologies” as the way to break down these barriers. This kind of idealism and engagement with larger political and social concepts echoes the afro-futurist ideas of Detroit, and Berlin’s post reunification scene. Licht is actively trying to make these connections happen, working to establish projects to connect various producers, software engineers and creatives with Mexican counterparts. Your label’s manifesto explicitly references social change as a goal for your art. Can you tell us more about that? After my last visit to Europe I realized that even though my main influences are from there, everything has been done, in a way. So I see the future as new places – Latin America, Asia and Africa. I think the future of electronic music is there. When I'm talking about my country – it’s a beautiful place but there’s several things that need to be changed, and I think the best way to do this is by using technology and music to transform society and leave behind all the things that have been stalling the evolution of Mexico. I needed to design this manifesto to define what the real essence of the movement is. The sounds, artwork, label and track titles all suggest a level of tension. The imagery in particular is striking. 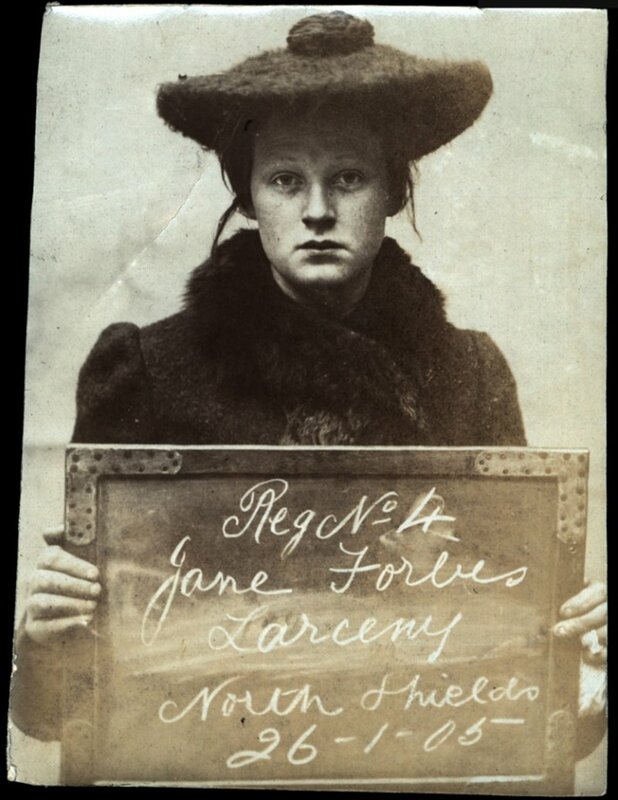 The artwork is made up of mugshots of women criminals from the 1800s. I was very intrigued about what these beautiful women have done to be considered criminals. I became fascinated by the women, and loved imagining their histories, and wondering what they had done. I see it as a connection to what i do – when I’ve been traveling abroad and I say I'm from Mexico, often the questions are all about the guns and blood and criminality. So by using a women to represent this idea of criminality, I’m transgressing the norm. This ties into how I am trying to breakdown the paradigm about how a women producer from Latin-America is supposed to be. It’s like - ‘yeah I’m from Mexico, I’m making techno, but I’m a woman”. Your recent show with Discwoman in Mexico City received a lot of attention. What do you think the legacy of that show will be? It was the last of a lot of exciting things to happen when I came back from Berlin and Loop. I moved to Mexico City and I started working at El Bedroom, the EP was done, the documentary and the showcase - everything was happening! It was great to get to know the Discwoman girls and what they are doing. The documentary was a big event and helped push the scene of all the women making music in Mexico. Next we are making a Boiler Room at the end of the month, I had my first gig in LA, and there is this new focus on music in the region. It’s like I said in the Tribes video – it’s the beginning of the end of the old way. It makes you realize the bright future Mexico has in terms of electronic music. Keep up with Demian Licht on Facebook and Soundcloud.